A $12,000 charter flight by Interior Secretary Ryan Zinke was reviewed and approved by department ethics officials without complete information, because staffers who helped schedule the trip did not provide sufficient details, an internal watchdog said Monday. A report by Interior's inspector general said Zinke's use of a chartered flight after he spoke to a National Hockey League team in Las Vegas "might have been avoided" if Interior employees had worked with the team to accommodate Zinke's schedule. Zinke and four Interior Department staffers flew on a private plane from Las Vegas to his home state of Montana in June 2017. Zinke has said no commercial flight was available for the late-night flight that allowed him to deliver a speech to Western governors the next day in Whitefish, Montana. Zinke, a former Montana congressman, was in Las Vegas to speak to the Vegas Golden Knights, the city's new National Hockey League team. The team's owner, Bill Foley, contributed to Zinke's congressional campaigns. The IG's report, issued Monday, said Zinke never mentioned the Interior Department or his role as secretary in the June 2017 speech to the fledgling hockey team, staff and coaches, instead focusing on his experience as a former Navy SEAL. An ethics official said the speech should have been tied to the department's mission to qualify as an official event. The ethics official, Melinda Loftin, told investigators she did not know that the team's owner had donated to Zinke's congressional campaign until it was reported in a newspaper article after the speech. 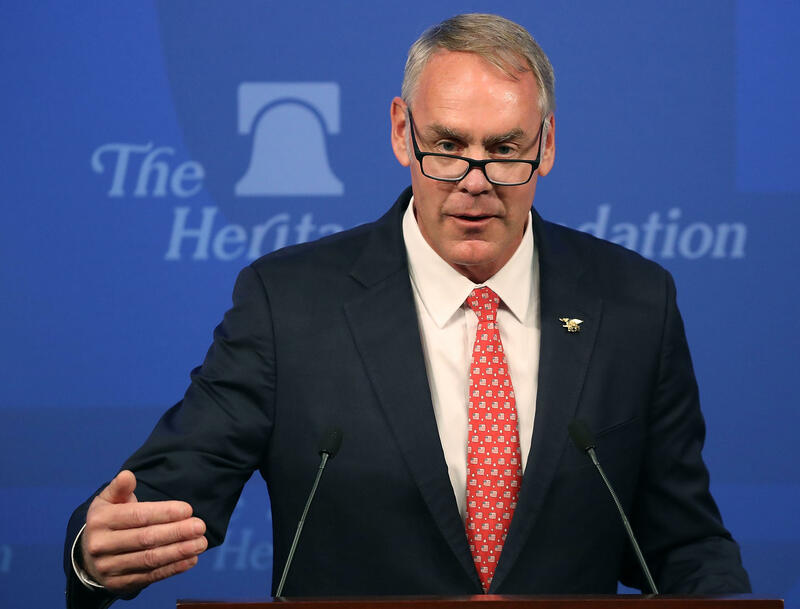 The campaign contribution by itself "probably would not have changed her opinion about whether Zinke could speak at the event in an official capacity," the report said. But if Loftin had known the team owner had been a campaign donor "she might have discussed the optics of Zinke's involvement" with the department's lawyers, the report said. Two other charter flights taken by Zinke, in Alaska and the U.S. Virgin Islands, "appeared to have been reasonable as related to official DOI business," the report said. Zinke is one of several Cabinet members facing questions about their spending and travel. Former Health and Human Services Secretary Tom Price resigned last fall amid criticism of his pricey travel, and Veterans Affairs Secretary David Shulkin was ousted last month, in part over ethics violations during an 11-day trip to Europe in which his staff doctored emails to justify his wife traveling for free at taxpayer expense. EPA Administrator Scott Pruitt also faces questions about first-class flights, luxury hotels and unusual security precautions. Zinke's spokeswoman, Heather Swift, said the inspector general's report "said exactly what was known all along: The use of chartered aircraft 'followed relevant law, policy, rules, and regulations' and appeared reasonable for official DOI business." The report also shows that in every instance reviewed, Zinke's staff consulted with and sought prior approval from career ethics officials and travel lawyers, "and that we follow their expert advice," Swift said. Ethics officials "were given all the information they asked for," Swift added. "Had they asked for more it would have been provided." Zinke has defended his use of private charter flights for government business, calling criticism of his taxpayer-financed travel "complete and utter bull" and driven by politics. Arizona Rep. Raul Grijalva, senior Democrat on the House Natural Resources Committee, said "Zinke ignores the rules when it suits him," adding that Republicans in Congress have shown little interest in conducting oversight of Zinke or other Trump administration officials. In addition to the three charter flights, which cost a total of $19,457, Zinke faces questions about three helicopter trips that cost more than $53,000, including one that allowed him to return to Washington in time for a horseback ride with Vice President Mike Pence. The IG's report did not address the helicopter flights. Zinke "needs to stop treating federal resources as his personal fiefdom," Grijalva said.